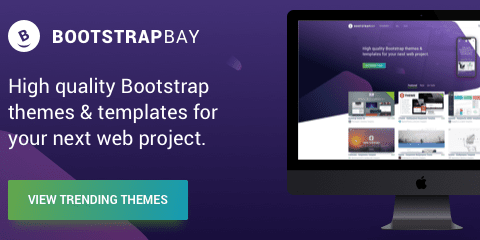 You sell a website by showing someone a theme and when it’s done your client is confounded because the images in the theme demo are not included. As experts, we take for granted that images in theme demo screenshots need to be bought separately on most occasions, but a client may have chosen a theme based on the visuals you showed them. Get around the problem by explaining that photos are not included and that you will source others that will give the same effect. Photographers and the models they use in stock photos need to be compensated for their work. When you buy a license, some of your payment goes to the agency and some to the photographer (who has often paid the models in advance for the rights to use their image). There are two common types of licensing; royalty-free and digital rights managed (DRM). Royalty free images are yours to use according to the license conditions once you have paid for them. DRM images have a variety of conditions attached to their usage including the type of usage (online, print, logos, etc. ), the number of copies or online views, and what countries they can be used in. CC0 (Creative Commons 0) licenses are common. This is a public domain license where the owner has repudiated all rights to the image. However, even here you may still face legal issues if the photo contains any faces or trademarks such as car manufacturers’ badges on radiator grills of any cars in the shot. The client’s reaction to high-price stock images may be to use a Google image search and find free pictures. This presents you with another problem: Explaining that these photos may be stolen or otherwise subject to copyright restrictions. The problem is made worse because so many amateurs have the attitude that everything on the Internet is free and theirs’ for the taking. 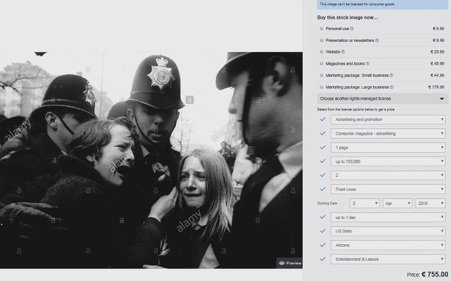 When your client shows you something they found using a Google image search, you need to explain the whole complicated world of image copyright and why you can’t be a party to stealing unlicensed photographs. Another source of unique images is Flickr, but would you trust Yahoo! with your personal details? Me neither, yet you must now have a Yahoo email address to use Flickr.com. 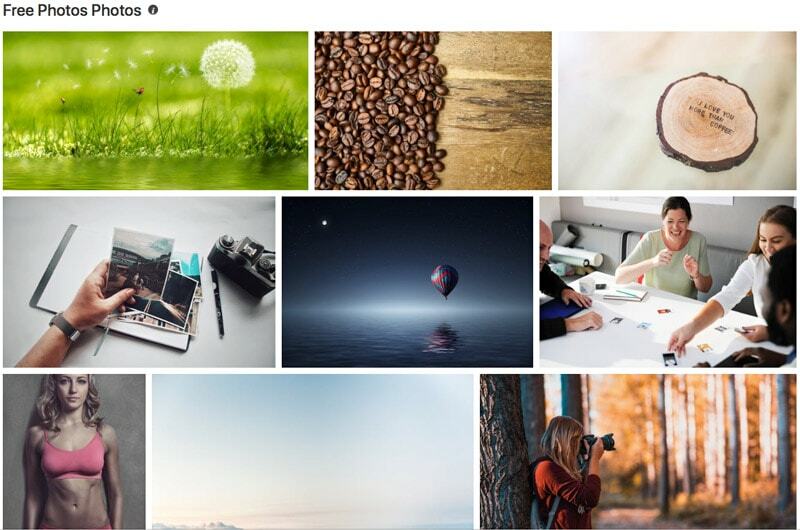 Flickr users have been known to repost copyright images they have found online as creative commons (CC0). Even if you use them in good faith, you are liable for a bank account breaking lawsuit for copyright infringement. If a client reveals his preferred photo is one he found on Flickr, you need to explain that many pictures on the platform have been stolen. If the client insists, then have a legal document drawn up absolving you of all responsibility and placing the client rather than you in the legal firing line. However, if you intend to use a picture of another beautiful person using a laptop, you might want to think again. Photoshopped images of beautiful computer users are everywhere. Your client needs to convey the idea that they are original, the ‘real deal,’ so using an image everyone has seen on hundreds of other websites won’t work. 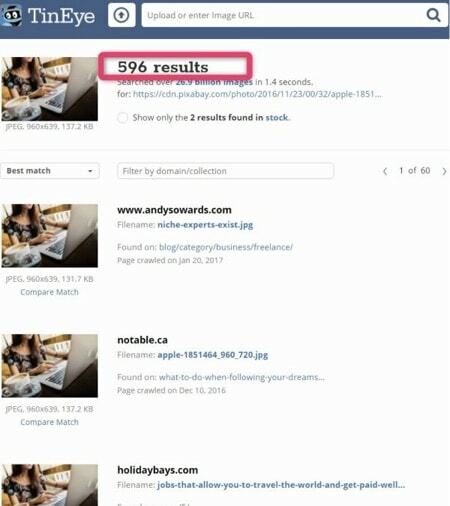 Always use a reverse image lookup program such as TinEye to check how many other website builders have used the image you think looks so fresh and unique. Free photographs are good because they are free, but if you want something approximating to unique, you might have to do some creative editing so the average person cannot identify the original. Free photos work well for website backgrounds, especially after cropping or editing to make them darker or blurred. For featured photographs and hero shots, unique images are mandatory. 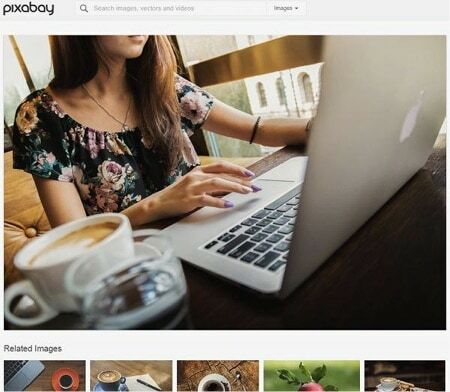 There are scores of sites where you can buy photos, but a search will reveal that even these images have been used by many other websites. You will need to pay a lot more for an exclusive license. Pay close attention to the license details, particularly in the case of DRM photographs. If you are buying an image from a stock photo site, it is best to explain your intended use to a representative. You will be asked questions such as how many people will see the image, what countries will it be shown in, and whether it will be part of a sales page. Have your answers ready. Many stock agencies hide their fees until you send a request explaining your proposed use. Alamy.com has one of the least obscure pricing models. Your design fees are unlikely to be high enough that you can afford to swallow the costs of buying photos from stock agencies. 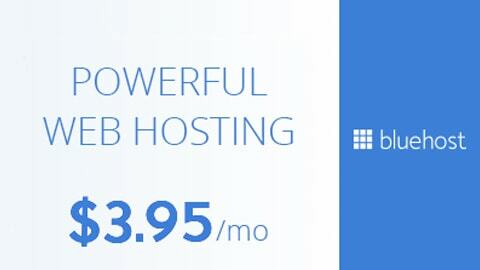 If your client is intent on using such images, you need to point out the restrictions on use and the costs. Many clients will rethink their requirements when they realize the financial hit involved. You can exercise your Photoshop skills on market-specific templates, available for most niches. 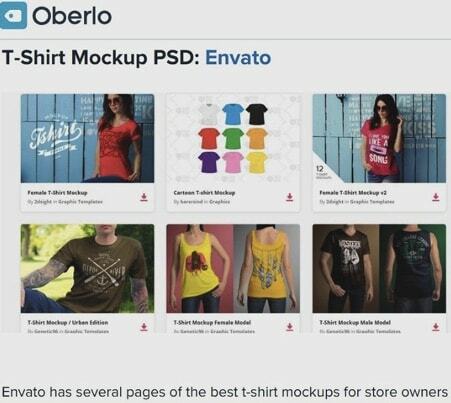 As an example, if you are building a tee-shirt site, here’s a link to 40 PSD tee-shirt mockup templates on Oberlo. Tee-shirt templates that include the model’s face will cost more, but you will find yourself stuck for choice. 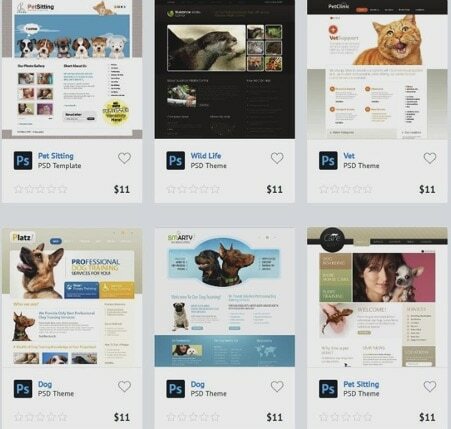 Niche-specific PSD website themes are widely available, such as the pets themes shown below from Template Monster. These will be unique. You will own the copyright, and they will be better than any expensive photoshopped image you can buy. You can take perfectly good photos for web use with a mid-range phone camera: The secret is in the editing. You can add atmospheric effects using Photoshop, but remember not to over-process your models, so you leave the people with their imperfections. Just because you can, doesn’t mean you should edit. Editing is useful to remove extraneous objects from a photograph, but should otherwise be limited. Your first rule in editing should be, “Is it essential?” Avoid the temptation to make grass greener, colors more vivid and a model’s skin glow. And never slim down or reshape the people in your photographs. If you need to change an image to use it as a background, by making it darker or reducing contrast, then that counts as essential, because you don’t want the photo to distract webpage users from the content. Website clients are hard to please. They want the impossible, and it’s your job to deliver. You don’t have to make your life impossible though; there is no need to design every icon from scratch because there are downloadable sets available for low prices. Avoid over-used free images and check how many other copies of any image already exist online. 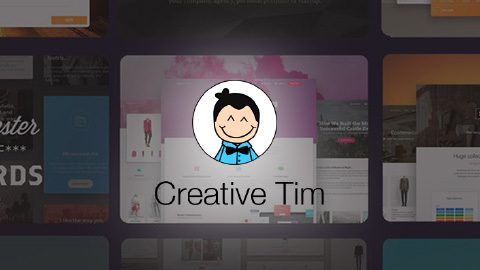 PSD templates and your own photos are the best solutions for most designers.